In our society it seems as if waiting has become a sign of weakness. The weak wait and the powerful take hold. We have become a society of drive-thru breakthroughs. In our haste we have made big decisions to our detriment. We rush into buying everything, into being with anyone and saying anything. The evidence of this lifestyle is all over; from marriages crumbling, to a nation in severe debt and to a steady rise in stress and depression. Several years back I was so stressed out with a job I had forced myself into; a relationship I was forcing to work and severe weight gain. The cause of my derailed life was no one’s fault but my own. My life was a result of the choices I had made. It was my choice to impatiently choose a career I thought would bring me tons of money, instead of dealing with the fact I was in debt. It was my choice to enter into a relationship with someone shortly after ending another relationship because I didn’t want to deal with loneliness. It was my choice to turn to food to cope with my feelings instead of dealing the bad attitude that was causing them. The commonality in all these events was they were all a result of doing things my way instead of waiting on God. I remember when I finally got it; I had a breakdown one night on the floor of my bathroom and I was tired. I was emotionally, physically and spiritually drained. I was tired of things failing and making the wrong decisions over and over. I couldn’t continue to live that way. I remember praying that night and I thought to myself “I am tired of doing things my way; I am going to try doing things God’s way.” I now realize that God used those hard events in my life to bring me closer to him. Everyone has their own spiritual path, some people don’t have to learn the hard way but I had to have my life go up in smoke for God to get my attention. Through just seeking God, reading his word and praying he has given me insight on his best for me. There is a difference between his “best” and my will. Everyone knows the old adage “God don’t bless no mess” and this is true! God’s best is complete and without question; you don’t have to doubt or worry. For example, I was looking for an apartment last year and I was desperate to find something quickly because my commute was wearing me out. I found a place that I thought was God’s best, but I was worried and doubted the area I even considered purchasing a weapon for protection. My mom arrived on move-in day and refused to help unpack my things. Her strong reaction scared me and I ended up not moving in. I waited a few more months and found the perfect apartment in the best area; the place even had room for a garden- as soon as I saw it I knew it was God’s best for me and not my impatient will. Many times we miss God’s best because we are tired of waiting. We miss out on God’s best marriage partners because we get tired of waiting and end up with someone who can’t commit to us on Facebook much less in life. We miss out on God’s best job opportunities because we get proud and impatient, and refuse to do work that is “beneath us” all the while God is preparing us for his best. We jump out there and buy things we don’t need, more expensive houses and cars missing God’s best when a great business opportunity comes by we are too broke and miss out. 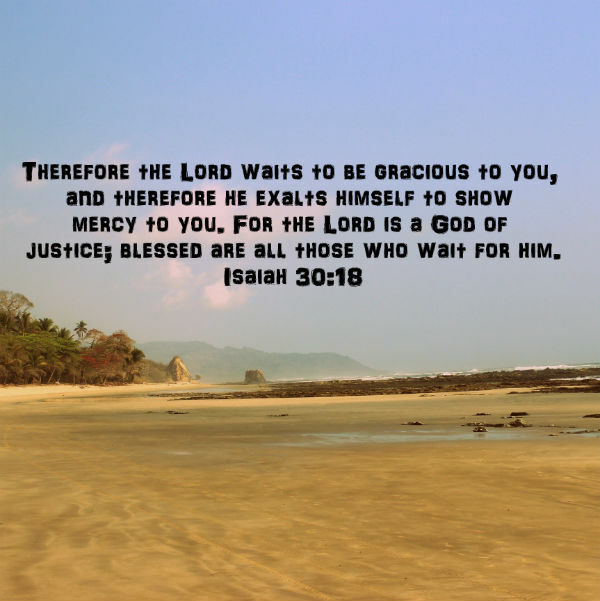 Wait on God! His timing is perfect. Sooner or later you become exhausted and tired of doing everything on your own only to yield failure, anxiety and hurt. Waiting on God does not mean twiddling your fingers or waiting for a sign. Waiting on God is active. Actively seeking him and working on you. Waiting is learning his will for your life, and asking him to reveal areas of your life that need improvement. It is becoming of service to him, giving to others and truly walking in love. You will become so engulfed in actively seeking and doing the will of God when you look up God will have worked all the areas out that you tried to force in the past. The cool thing about God is once you put your trust completely in him; and you live and wait like you truly trust God he will work out every area you trust him with. The more you fully submit to God and give him, the more he will show you he is in control. He will give you the grace to wait, and develop your character along the way. So wait on God’s best for your life, it is worth the wait!